Tofu is not only healthy, but it is also usually cheaper than using meat. When prepared the right way, it's super tasty and versatile. We used Brussels sprouts, but you can use any veggies you'd like for this dish - broccoli or cauliflower would also be delicious. 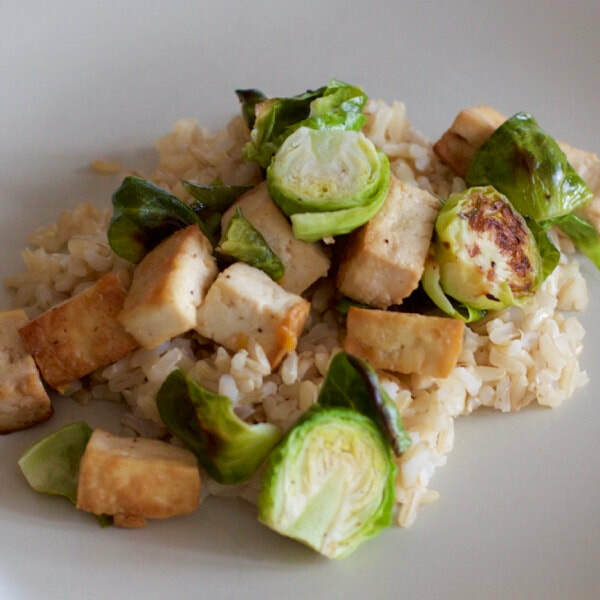 Learn more on How to Cook with Tofu here. Preheat oven to 400°F, and spray a baking sheet with nonstick spray, or rub on a thin layer of oil. Sprinkle tofu cubes with corn starch (if using) in a medium size bowl, and gently stir to evenly coat (using your hands may be easiest). Combine 1 Tbs canola oil with garlic and ginger powder in a small bowl, then add to tofu. Gently stir to evenly coat. Place Brussels sprouts on one half of the baking sheet. Drizzle with olive oil, sprinkle with salt and pepper, and use your hands to toss and spread them out on their half of the baking sheet. Add tofu to the other half of the baking sheet. Roast in the oven for 10 minutes, then use tongs or 2 forks to toss the sprouts and tofu. Place back in the oven for another 10-15 minutes, or until tofu is slightly crisped and sprouts are starting to brown. Serve on it's own or over rice or quinoa.